As you can see in the image above (circled in red with 3 red arrows pointing), after making your account on CozyCot, head on over to CozyCot's CC Board and wait for the page to finish fully loading. Once done, you should see something like the next image. As I've once again highlighted in red in the image above, you can either sift through quest(s) you prefer or do almost everything in there. As long as you have a brand new account, the site will guide you on what you should do to get the Reward Coins. 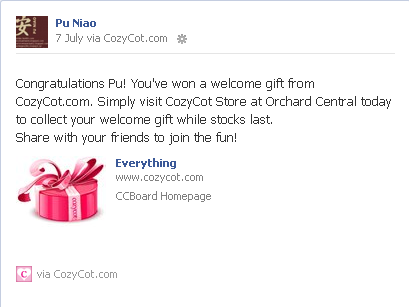 Despite already being logged in, just go back to Cozy Cot's main page, scroll down until you see Member's Exclusive / Connect with Facebook / Receive a Welcome Gift! section. It's not that hard to see or find on the main page, so don't worry. Once everything is fully loaded, head over to your Facebook wall and look for a similar wall post like the image above. DO NOT DELETE THIS WALL POST! When you get to CozyCot's retail store, they will need you to log into your Facebook account to see it in order to give you your welcome gift. There's no need to try and print out that wall post nor even try to snap a photo on your camera or cellphone, they have to physically check it. And once confirmed that you have the wall post intact and untouched, you can choose 1 welcome gift out of 6 possible items. I chose the Leaders Clinic Vita Whitebeam Essential Mask (from Leaders Clinic on Facebook). And on top of that, I got an additional 3 more free items. 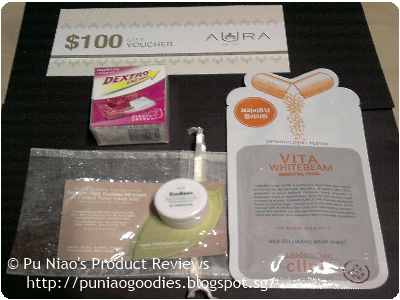 A SGD100 AURA Day Spa Gift Voucher, a EcoBeau Natural Nutritive BB Cream Sample (from TheOrangeCo.com) that comes with a small notepad in the shape of a leaf, and finally a small box of Dextro Energy Raspberry-flavored candy. Going back to the other topic on CozyCot, forgotten to check my email at least last night for a few confirmation emails. But I'm definitely sure glad I did so today and saw my long-awaited rdemption emails from CozyCot. I get to redeem a total of 9 sample products for free, with 2-3 repeat items that I definitely craved. Turns out, I had to print out the redemption email, fill in my particulars and bring them down to CozyCot's retail store to make the redemption. I'd probably need a bigger bag to hold my goodies for tomorrow's trip.